DALLAS, TX / ACCESSWIRE / April 2, 2019 / EarthWater, a health and wellness company which produces high-alkaline, mineral infused supplement products, is proud to announce EarthWater products have been selected as the Official Water of the 2019 Dallas International Film Festival Gift Bags (www.dallasfilm.org) during the April 11th through April 18th Film Festival in Dallas, TX. Dallas Film exists to make the art of film accessible to the Dallas community through year-round screenings, education, training, and operating the largest film festival in North Texas - Dallas International Film Festival, powered by Capital One. We are a 501(c) 3 nonprofit organization established in 2006 by people who love the magic of film. Since its inception, Dallas Film has contributed more than $1M in filmmaker awards, brought over 2000 filmmakers to Dallas, screened over 2000 films from more than 50 countries. We are proud to support local filmmakers, as well as fellow film organizations in DFW. For tickets and more information visit www.dallasfilm.org. EarthWater is a health and wellness company and manufacturer of mineral infused high-alkaline beverages and liquid concentrate with proprietary blends of natural organic trace minerals mined from deep within the earth's surface. These minerals are composed of ''Fulvic and Humic'' and have rehydrating and detoxifying qualities that can inhibit free radicals and improve absorption of key nutrients. EarthWater products are sold at www.earthwater.com ''follow'', "like," and "share" our social media pages @earthwaterhq. Please direct inquiries to info@earthwater.com or visit www.EarthWater.com. The Dallas Police Cycling Team (DPCT) is a 501(c)3 non-profit organization, created to raise awareness of Law Enforcement Officers who have died in the line of duty and to assist those Dallas Police Officers'families. The DPCT manages the HALOS, (Helping And Loving Our Survivors) fund, designed to provide ongoing support for the survivors' families, while letting them know they will never be forgotten. The DPCT is comprised of active and retired law enforcement officers who volunteer their own time to participate in local rides throughout the DFW metroplex and all over the great State of Texas, as well as other parts of the United States. Every event they attend is a chance to make new friends, as they ride to honor our fallen. The DPCT provides financial assistance to its members to ride in the Police Unity Tour as well as the Texas Peace Officers Memorial Ride every year. The riders' donations to the Police Unity Tour supports the National Law Enforcement Officers Memorial Fund, which it built to maintain the nation's monument to Law Enforcement Officers killed in the line of duty. The Texas Peace Officer's Memorial Ride donation is divided among the three C.O.P.S (Concerns for Police Survivors) Chapters in; Texas Metroplex, Greater Houston and South Texas. The 2019 Events include the Ride to Remember, Hotter Than Hell, Cotton Patch, Turkey Roll and more. In August, DPCT will also participate in The Unity Tour, which is a large 3-day event in Washington D.C. with an estimated 35,000 + in attendance from around the world. 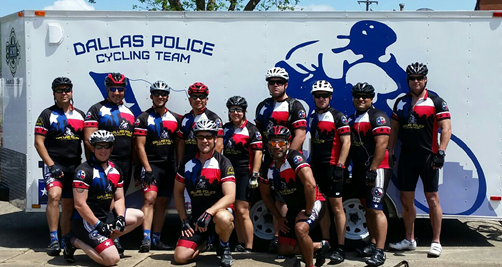 The Dallas Police Cycling Team (DPCT) is a 501(c)3 non-profit organization created in June 2014 to raise awareness of Law Enforcement Officers who have died in the line of duty, and to assist our Dallas Police Officer families. The DPCT manages the HALOS (Helping And Loving Our Survivors) fund, designed to provide ongoing support for the survivors, letting them know they will never be forgotten. For more information or to donate, please visit; www.dpdcycle.com. EarthWater is a health and wellness company and manufacturer of mineral infused high-alkaline beverages and liquid concentrate with proprietary blends of natural organic trace minerals mined from deep within the earth's surface. These minerals are composed of ''Fulvic and Humic'' and have rehydrating and detoxifying qualities that can inhibit free radicals and improve absorption of key nutrients. EarthWater products are sold on www.earthwater.com or on Amazon in over 121 countries around the world. To engage with EarthWater online, you are encouraged to "like," "follow," and "share" on social @earthwaterhq. Direct inquiries to info@earthwater.com or visit www.EarthWater.com. DALLAS, TX / ACCESSWIRE / March 5, 2019 / EarthWater, www.EarthWater.com, a Texas manufacturer of consumer health and wellness products, announced today the Company is launching a new 'Private Label Program' in response to enormous requests from Corporate Clients desiring to enter the "Black Water" category as well as to expand into the number one growing Private Label Water Market, now exceeding $2.8 Billion Dollars. EarthWater Chairman/CEO CJ Comu stated, "We knew people were fascinated and wanted to enter the category we built for 'Black Water' rather than have potential competitors entering to this highly sophisticated and proprietary process, we decided to be the source manufacturer and allow the market to experience and enjoy what we have been selling world-wide for five years. This further supports our mission statement 'to help change and improve people’s lives with the power of natural trace minerals and a natural high pH." Mr. Comu added, "We invite all Health Clubs, Schools, Fitness Centers, Country Clubs, Sports Teams, and any other organization ever wanting their unique brand on our healthy, proprietary formulation to contact us at info@ewbev.com." According to 'Beverage Industry Magazine' https://www.bevindustry.com/articles/91667-private-label-resonates-as-premium-value-focused?v=preview, as the consumer-packaged goods, (CPG) market continues to influx with value-focused brands, experts note more and more retailers are placing greater emphasis on their own brands. With steadily increasing sales, private label CPGs are giving branded products a run for their money. According to Chicago-based Information Resources Inc.'s (IRI) November, 2018 Private Label Report, "Retailer private-label programs are taking off and transforming the CPG industry, providing consumers not only value, but also products having high ethical, environmental and taste standards." Leading the Private Label sector is Convenience/PET Still Water and Seltzer/Sparkling/Mineral Water, which also marked an increase, each rising in dollar sales by 10% and 9.5% respectively, over the previous year based on IRI data. According to New York-based Beverage Marketing Corporation's (BMC) October 2018 Report titled Private Label Beverages & Contract Packaging in the U.S., sales of private label products of all types once again increased in 2017, reaching $122.3 billion, an increase of almost $3 billion from 2016, it states. This year, private label dollar sales grew 5.8%, outpacing national brands and the overall CPG sector by 1.5% and 2.1%, respectively, according to the same report. Private label accounts for 16% to 20% of CPG dollar spending across generations, it adds. Experts note a key to success of private label products is getting consumers to view them as they would any other brand. Success in today's private label business, is now attributed to product quality, distribution, capacity and price, whereas it was virtually all about the price in the past, BMC's Report states, "While price may be what draws consumers to the private label brand, the quality and value will keep the consumer as a repeat purchaser." Gary Hemphill, managing director of research at BMC notes, the pivotal role price plays in the category, "the primary reason people purchase private label products is price. Other factors like quality and packaging can contribute to the success or lack thereof of private label products, but price is the primary reason." A common theme within the bottled water category is retailers implementing private label programs, which helps consumers view private label products as they would any other brand. "Retailers with a successful private label strategy treat their private label products as brands and use traditional promotional tools to boost their sales," BMC's Report says. Who buys private label? When it comes to purchasing private label, the incidence can vary based on generation demographics. The following chart is a break-down of consumers who expect to purchase more private label during the next six months with total population by generation. "ECommerce private label sales are seeing explosive growth across food and beverage and non-food categories," the market research firm’s report states, "The growth of eCommerce will also allow retailers to target shoppers in new markets and build trust in their private label lines," according to IRI. EarthWater is a health and wellness company and manufacturer of mineral infused high-alkaline beverages and liquid concentrate with proprietary blends of natural organic trace minerals mined from deep within the earth's surface. These minerals are composed of "Fulvic and Humic" and have rehydrating and detoxifying qualities that can inhibit free radicals and improve absorption of key nutrients. EarthWater products are sold through online Membership Sites and through the Amazon Exclusives Program. To engage with EarthWater online, you are encouraged to "like," "follow," and "share" our social media pages. Please visit www.EarthWater.com. ADDISON, TX / ACCESSWIRE / February 19, 2019 / EarthWater Founder and CEO, CJ Comu, announced today he is running for City Council in the City of Addison, Texas. https://addisontexas.net/. Addison, TX is a vibrant City in the heart of Dallas, TX. Supported by 15,000+ residents, an annual city budget of over $100M with a Net Asset Value of over $4.5B and, according to the FAA, one of the busiest private airports in the USA, Addison is an incredibly vibrant business and residential community. Addison is truly one of the best kept secrets in the Central United States. Mr. CJ Comu is a 25-year professional corporate veteran, creating, mentoring and operating numerous private and public companies as Chairman/CEO. He has extensive global knowledge and experience in building, funding and operating business ventures with a track record of over 100 companies he has counseled or served as Director. Mr. Comu is Founder Chairman & CEO of EarthWater Limited, a manufacturer of health and wellness products sold in over 121 countries in partnership with Amazon. Mr. Comu is Chairman of Regus Advisors, Inc., former Chairman/CEO of SUN Sports & Entertainment (a public company), former Chairman/CEO of Humitech International (an international franchise company) and former Chairman/CEO of Airtech International Group, (a public company) and other entrepreneurial ventures. Mr. Comu started his professional career in 1980 as Founding Partner of MBA Software Inc, one of Canada's first Software Development Company's for Apple Computer working with Steve Jobs. 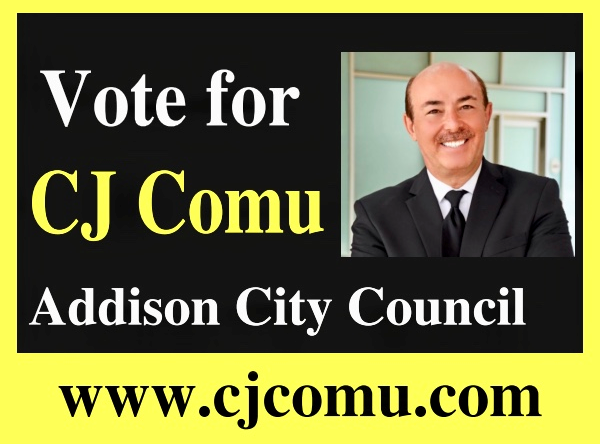 Mr. Comu's list of accomplishments and support include; being former President of the Addison Rotary Foundation, Former Vice Chairman of Galleria Credit Union, Charter Member of InvestIn Forum, Member of the North Texas Leadership Board of the American Diabetes Association, Member of the City of Addison Economic Development Commission and finally he was a Nominee for the Ernst & Young 2018 Entrepreneur of the Year Award. Mr. Comu is a former speaker at Southern Methodist University (SMU) to the Business Graduate Program on Venture Finance and Business Strategies as well as a Mentor at the University of Texas at Dallas (UTD) Dallas MBA Program and Mentor at the Addison Treehouse in conjunction with the Dallas Entrepreneur Center (DEC). He sits on several Boards and serves as a Mentor, Panelist and Keynote Speaker. Mr. Comu has been on Television, Magazine, Radio, and a Keynote Speaker and Panelist on numerous events world-wide. CJ and his wife Phyllis, a native of Dallas, Texas, have been married over 20 years. She is an animal advocate with the SPCA. They are proud parents of two rescue Boxer Dogs and continue to work with animal charities. They are also supporters of Saint Michael & All Angels Episcopal Church and are 20-year Addison homeowners. You can follow Mr. Comu on LinkedIn, Facebook, Instagram and Twitter (@cjcomu). CJ Comu is an American Icon Entrepreneur with an extensive global business resume. You can learn more by visiting www.cjcomu.com. If you would like to book Mr. Comu for a speaking engagement, please contact his Campaign Manager at: 1911consulting@gmail.com. Addison, Texas, located in the heart of Dallas, is an ideal destination to live, work and play. Designed with entrepreneurial innovation and driven by community spirit, our unique 4.4 square mile urban enclave boasts 180+ restaurants, 22 hotels, upscale living, unique retail shops and more than 12 million square feet of office space https://addisontexas.net/. EarthWater is a health and wellness company and manufacturer of mineral infused high-alkaline beverages and liquid concentrate with proprietary blends of natural organic trace minerals mined from deep within the earth's surface. These minerals are composed of ''Fulvic and Humic'' and have rehydrating and detoxifying qualities that can inhibit free radicals and improve absorption of key nutrients. EarthWater products are sold on www.earthwater.com. ''Follow,'' "Like," and "Share" our social media pages @earthwaterhq. Please direct inquiries to info@earthwater.com or visit www.EarthWater.com. LAS VEGAS, NV / ACCESSWIRE / February 5, 2019 / EarthWater, a health and wellness company which produces high-alkaline, mineral infused water and mineral supplement products, is proud to announce its roles as Presenting Sponsor & Official Water of the 2019 Miss Earth USA Pageant, www.missearthusa.com, on June 30, 2019, LIVE from South Point Hotel & Casino, Las Vegas, NV. Miss Earth USA is the national preliminary to the top-ranking Miss Earth International Pageant in the Philippines. Known as ''beauties for a cause,'' the mission of Miss Earth USA is to support women as they lead their communities in environmental responsibility, while engaging in fashion, modeling and media opportunities. View the 2018 Pageant here: https://www.youtube.com/watch?v=F4-z4uyOLsw&t=1435s. ''We're honored to welcome EarthWater back as the Presenting Sponsor of the 2019 Miss Earth USA pageant in Las Vegas and are grateful they have continuously engaged in partnership opportunities for our state and national delegates. Their products are a perfect match for our ladies to stay hydrated and healthy while enjoying their busy lifestyles,'' stated Laura Clark, National Director Miss Earth USA. Miss Earth USA is the national preliminary to the top-ranking Miss Earth international pageant in the Philippines. Known as ''beauties for a cause,'' the mission of Miss Earth USA is to support women as they lead their communities in environmental responsibility, while engaging in fashion, modeling and media opportunities. Follow Miss Earth USA: www.missearthusa.com. For Media Information on EarthWater or to book Founder/CEO, CJ Comu for press interviews or speaking engagements, please contact Kim Francis - Director Strategic Marketing, via email: kf@earthwater.com or to call her directly: (469) 802-6266 X108. DALLAS, TX / ACCESSWIRE / January 22, 2019 / EarthWater, a health and wellness company which produces high-alkaline, mineral infused mineral supplement products, is proud to sponsor Team First Responders, a group of brave men and women from Dallas Fire Departments in the 11th Annual Big D Climb benefitting The Leukemia & Lymphoma Society (www.lls.org). The EarthWater sponsored team of 10 Local Fire Fighters/First Responders will climb 70 flights of stairs at the Bank of America Plaza located in Downtown Dallas, TX. This is the tallest building in the city and the 30th tallest in the USA. The climb will take place on Saturday, January 26, 2019 and is part of the annual fund-raising challenge for The Leukemia & Lymphoma Society, supporting efforts to discover a cure for leukemia. EarthWater Founder/CEO CJ Comu stated, "We're honored to be participating in the Big D Climb again - and proud to be back with Team First Responders, to support our local first responders for the sacrifices they make every day to keep our community safe. The mission of the LLS is very important to us, we want to see everyone's health improved and lives saved." EarthWater has a longstanding relationship with the Addison Fire Departments and keeping the stations stocked with EarthWater's mineral infused water for hydration and health. Members of local Dallas Fire Departments sporting Team EarthWater products and gear in preparation for the 70-story Big D Climb. To support Team First Responder's fundraising campaign with a donation, click on the following link: http://ow.ly/Otk650kdS3z. The Big D Climb is the biggest stair climb in North Texas. Participants race against time, up 70 stories of stairs at Bank of America Plaza in Downtown Dallas, to raise money for blood cancer research. More than 1,600 climbers race and help to raise more than $255,000 for The Leukemia & Lymphoma Society, www.bigdclimb.org. LLS is the world's largest voluntary health agency dedicated to blood cancer. The LLS mission: cure leukemia, lymphoma, hodgkin's disease and myeloma, and improve the quality of life of patients and their families. LLS funds lifesaving blood cancer research around the world and provides free information and support services. Learn more at www.lls.org. EarthWater is a health and wellness company and manufacturer of mineral infused high-alkaline beverages and liquid concentrate with proprietary blends of natural organic trace minerals mined from deep within the earth's surface. These minerals are composed of ''Fulvic and Humic'' and have rehydrating and detoxifying qualities that can inhibit free radicals and improve absorption of key nutrients. EarthWater products are sold through online Membership Sites and through the Amazon Exclusives Program. To engage with EarthWater online, you are encouraged to "like," "follow," and "share" our social media pages. Please direct inquiries to info@earthwater.com or visit www.EarthWater.com. For More Information on EarthWater or to book Founder/CEO CJ Comu for press interviews or speaking engagements, please contact Kim Francis - Director Strategic Marketing via email at kf@earthwater.com or you may call or text her directly at 469.713.7616. DALLAS, TX / ACCESSWIRE / January 15, 2019 / EarthWater www.EarthWater.com, a Texas manufacturer of consumer health and wellness products, is excited to guest host ''In the Know with Brian Glenn'' from 3:00pm CST to 5:00pm CST on both Thursday January 17th and Friday January 18th on KEXB 620AM Radio, a financial news/talk radio station owned by the Salem Media Group https://620amkexb.com/content/all/brian-glenn. Plus a few other surprise special guests. You may listen LIVE online at the following link: http://player.listenlive.co/56721. KEXB is a commercial AM radio station licensed to Irving, Texas and serving the Dallas/Fort Worth Metroplex. The station airs a financial news/talk radio format and is owned by the Salem Media Group. For More Info: www.620amkexb.com. Dallas, TX / January 8th, 2019 / EarthWater www.EarthWater.com a Texas manufacturer of consumer health and wellness products, congratulates Extreme Athlete Bo Marchionte, on an incredible 21 year non-stop running journey. Bo Marchionte is recognized as an expert NFL Draft analyst. He has covered the NFL for over a decade and his background includes being on staff for collegiate all-star games as a talent evaluator for player personnel along with scouting for the Winnipeg Blue Bombers of the Canadian Football League (CFL). EarthWater is proud to have Bo Marchionte as a brand ambassador and extend our biggest congratulations to him for his amazing achievement. Bo continues to be an inspiration to us all especially diving into this New Year and striving to make 2019 our healthiest year yet. EarthWater is a health and wellness company and manufacturer of mineral infused high-alkaline beverages and liquid concentrate with proprietary blends of natural organic trace minerals mined from deep within the earth's surface. These minerals are composed of “Fulvic and Humic” and have rehydrating and detoxifying qualities that can inhibit free radicals and improve absorption of key nutrients. EarthWater products are sold through online Membership Sites and through the Amazon Exclusives Program. To engage with EarthWater online, you are encouraged to "like," "follow," and "share" our social media pages. Please direct inquiries to info@earthwater.com or visit www.EarthWater.com. DALLAS, TX / ACCESSWIRE / January 1, 2019 / EarthWater (www.EarthWater.com), a health and wellness company, based in the Dallas/Fort Worth metroplex and manufacturer of consumer health products, is excited to help kick off 2019 with a New Year - New You Contest providing EarthWater for ONE YEAR to a lucky person. To qualify – see instructions below, Winner announced on January 31, 2019. Below are some great TOP TEN TIPS from our friends at One Green Planet. Soluble fiber is a type of fiber that’s been shown to dramatically improve heart health, improve blood sugars and enhance digestive health. The soluble fiber in oats, apples, pears, and barley have all shown to reduce cholesterol and help keep you full. No chalky fiber supplements needed here! Add whole food sources of soluble fiber instead. This type of fiber gels up in the intestines that digest more slowly. As it does, two things happen: it regulates digestion and also whisks away cholesterol that clogs your arteries and toxins that weaken immunity at the same time. Other good sources include oranges, bananas, artichokes, blackberries, beets, onions, carrots, asparagus, pumpkin, potatoes, squash, and chia seeds to name some of the best. If someone wanted to know one food that could change their health above others, it would be greens. Spinach, kale, collards, and even others like romaine, turnip and mustard greens are all packed with chlorophyll to reduce inflammation, improve liver health, high amounts of vitamin A (beta-carotene) that improves immunity andfights cancer, and high amounts of vitamin C and fiber. They are also very low in calories (if that’s a concern) and keep you satisfied a long time. One other benefit of greens is their high amount of magnesium, which reduces blood sugar, aids in energy, reduces stress, and helps you sleep. Raw or cooked, greens make a good choice. No hitting up any fancy smoothie joints with sugary or dairy-based smoothies here; make your own smoothies at home using real, whole foods. Why? Because this works in at least 3 or more fruits and/or veggies into your day (like those greens above) all in one serving. This prevents people who are busy (or don’t like a lot of kitchen duty) an easy way to get in these necessary foods for good health all in just minutes. It’s also much more filling than breakfast cereals, processed snacks, and is anti-inflammatory, unlike animal-based choices. A high-speed blender is life-changing for making smoothies, but even a household will do in a pinch. Here’s how to make a healthy, filling smoothie if you’d like some other special tips. We know, this is no fun to hear. No cake or donuts, you’re thinking? Not so! You can still enjoy these foods in a healthier form, without all the added sugar. Sugar is pretty much one of the easiest ways to gain weight and improve your risk of Type 2 diabetes – something I doubt anyone here is aspiring to. It’s also inflammatory, highly processed, and it doesn’t keep you full. Learn to make raw desserts using just dried or whole fruits instead, or use naturally sugar-free stevia. Here’s 10 raw cake recipes, a raw donut, and a raw cookie to get you started! And obviously, nature’s healthiest sugar – fruit – is the best choice of all. Avoiding sugar is also one of the best ways to reduce acne, ward off aging, and improve your overall taste buds. If you haven’t made the choice to eat a full vegan diet, do what you can to eat a plant-strong diet as much as possible. Not only is this a beneficial choice for the planet and animals, but it’s also one of the most clinically proven ways to improve your longevity and keep your weight and heart healthy for the longest period of time. There are many variations you can choose on a plant-strong diet. It’s not black or white; choose a soy-free, lower carb, gluten-free, or a simple, whole foodsvegan diet. They all work wonders! Water is necessary to maintain a healthy body and dehydration can lead to a host of health issues, many of which you might not be aware of. Plus, reaching for water means you’re not reaching for sugary drinks or caffeinated energy drinks that hurt your adrenals. Drink water several times through the day, or consume herbal tea, which is also rich in water naturally. Aside from making smoothies, make it a point to include a fresh piece of produce with every meal. This is pretty simple; if you do this three times a day for a week, you’ve consumed 21 fruits, veggies, or greens all without thinking about it. This choice means you won’t be turning to chocolate bars, sugary snacks, or high fat animal-foods to keep you full; produce can do that so long as you are sure not to forget it! Aside from your meals and drinks, please – go to bed earlier! Everyone preaches this, but many of us (guilty as charged here) don’t do it enough. Getting at least seven, preferably eight, hours will ensure your hormones are healthy, which equates to lower stress and a healthier weight that are key markers of good health. Plant-based sources of omega 3 fats are important for reducing your risk of heart disease, they improve brain health, they can help you reduce your risk for obesity and they reduce inflammation. Good sources include walnuts, chia, flax, cashews, almonds, hemp, avocado, sacha inchi seeds or protein, and acai berries to name some of the best. Your body needs calories to not just stay full, but also to keep GOING and stay strong. The fewer calories you eat, the more you tell your body that it needs to slow down to conserve energy. While you don’t have to pile heaps of calorie-rich foods like oil into your diets, you should be sure to eat a variety of complex carbs, healthy proteins, fats, and all the produce you can get your hands on. Your metabolism, brain health, and energy will all thank you for it – promise! Applicants will be reviewed by Team EarthWater and a Winner will be selected on January 31, 2019, to receive a case of EarthWater per month for twelve months. EarthWater is a health and wellness company and manufacturer of mineral-infused high-alkaline beverages and liquid concentrate with the proprietary blends of organic fulvic and humic complexes mined from deep within the earth's surface. Fulvic and humic minerals have rehydrating and detoxifying qualities that can inhibit free radicals and improve absorption of key nutrients. EarthWater products are sold through www.livepure.com/Restoring and online through the Amazon Exclusives Program. To engage with EarthWater online, you are encouraged to "like," "follow," and "share" the brand's social media pages. "Everyone has a purpose in this life, so try to look forward to every second of the day. Our life is meant to be lived right now." Integrative and Regenerative medicine, it was a match! She was quick to note that she is "always looking for alternatives for my patients who are open to options outside of what Big Pharma has to offer." This is an approach from which many in the health community could benefit. Today, more than 110 million Americans live daily with some form of chronic pain. For many years, Dr. Leal was one of those Americans. Diagnosed with rheumatoid arthritis at the age of 23, she completed her medical school and residency in a motorized yellow scooter. Wanting something more than what traditional medicine had to offer, she began a lifelong journey of education and looking outside the box…hence her relationship with EarthWater. As a result, Dr. Leal incorporates EarthWater as a tool for her patients who struggle with hydration, a key building block of health. Understanding the importance of the body’s natural ability to regenerate, Dr. Leal also uses EarthWater prior to every stem cell therapy aiding the patient’s body in its ability to regenerate, rebuild and repair. Dr. Leal has found a more integrative and holistic approach to health prevents overuse of unneeded medications and procedures. Hydration is a key component to recover from injury, trauma and pain. She says, “It's really exciting to see the changes I've gone through and share them with my family, friends and patients." For anyone who has ever tasted EarthWater, it is obvious how this product can be life-changing to one's diet. How would you recommend it to someone who isn't as familiar with the benefits? In the words of Dr. Leal “It’s simple, start with two bottles a day and notice how much better you focus and how much better you feel. We use regenerative therapies which allow the body to unleash its full potential and having the right tools are critical for patient results…EarthWater is one of those tools." EarthWater Limited is a health and wellness company, manufacturing mineral infused high-alkaline beverages and liquid concentrate with the proprietary Hydration Molecular Complex™ (HMC), using 100% natural, proprietary blends of organic fulvic and humic complexes mined from deep within the earth's surface. Fulvic and humic minerals have rehydrating and detoxifying qualities that can inhibit free radicals and improve absorption of key nutrients. EarthWater. To engage with EarthWater online, you are encouraged to "like," "follow," and "share" the brand's social media pages. EarthWater inquiries can be emailed to info@earthwater.com or visit http://www.earthwater.com/. Established in 2001, Hollywood Weekly Magazine features the best of Los Angeles Entertainment with style, class and flare, showcasing LA's rich cultural diversity in the world of arts and entertainment. HW is located in beautiful Santa Monica, CA, bringing HW closer to the stories you want to read about! For more info; call: 424.371.9900 or email, fal.adams@hollywoodweeklymagazine.com. For More Information on EarthWater or to book Founder/CEO CJ Comu for press, interviews or speaking engagements, please contact Kim Francis - Director Strategic Marketing via email at kf@earthwater.com or you may call or text her directly at 469.713.7616. HOLLYWOOD, CA / ACCESSWIRE / December 18, 2018 / EarthWater (www.EarthWater.com), a health and wellness company, based in the Dallas/Fort Worth metroplex and manufacturer of consumer health products, is proud to announce a partnership with Hollywood Weekly Magazine and Hollywood Weekly TV Show www.hollywoodweeklymagazine.com as the "2019 Official Water of Hollywood Weekly". As part of this partnership, EarthWater was featured in Hollywood Weekly's Annual Film Festival/Charity Event and the premier of Hollywood Weekly TV Show on December 15, 2018, now available to view on-line at https://vimeo.com/306740145. Prather Jackson, Publisher, Hollywood Weekly Magazine & TV Series, stated, "We are extremely excited to partner with EarthWater as they are establishing new benchmarks bringing health and vitality to the forefront of our consciousness." EarthWater Founder/CEO CJ Comu stated, "Delighted to partner with Hollywood Weekly Magazine and TV Show. Looking forward to sharing our products at the many events they support. Our mission statement to help change and improve people's lives by providing our all-natural mineral infused beverages is ideally suited to a healthy lifestyle that is California. We have thousands of people consuming our products and sharing in all categories from professional sports to business to traditional families. At the end of the day– what's most important is what you put in your body and we recommend EarthWater". EarthWater Limited is a health and wellness company, manufacturing mineral infused high-alkaline beverages and liquid concentrate with the proprietary Hydration Molecular Complex (HMC), using 100% natural, proprietary blends of organic fulvic and humic complexes mined from deep within the earth's surface. Fulvic and humic minerals have rehydrating and detoxifying qualities that can inhibit free radicals and improve absorption of key nutrients. Follow EarthWater on social media @earthwaterhq. EarthWater inquiries can be emailed to info@earthwater.com or visit www.EarthWater.com. DALLAS, TX / November 15, 2018 / EarthWater www.EarthWater.com a Texas based health and wellness company that makes mineral-infused, high-alkaline beverages designed to provide benefits such as boosting immunity, maintaining nutrient levels in the body’s cells and reducing toxins, is proud to sponsor Professional Baja Driver Josh Herzing and the 3p OffRoad Team https://3poffroad.com/ as the team competes in the 51st Annual Baja 1000 Race (a 806 Mile - 36-Hour Race) http://score-international.com. WHO: Nearly 300 racers from 38 U.S. States and 18 countries in both Pro and Sportsman classes, to include cars, trucks, UTVs, motorcycles and quads. *Racer Chassis Inspections started Monday, November 12th and racing culminates with official results and awards Sunday, November 18th in Escanaba BC, Mexico. 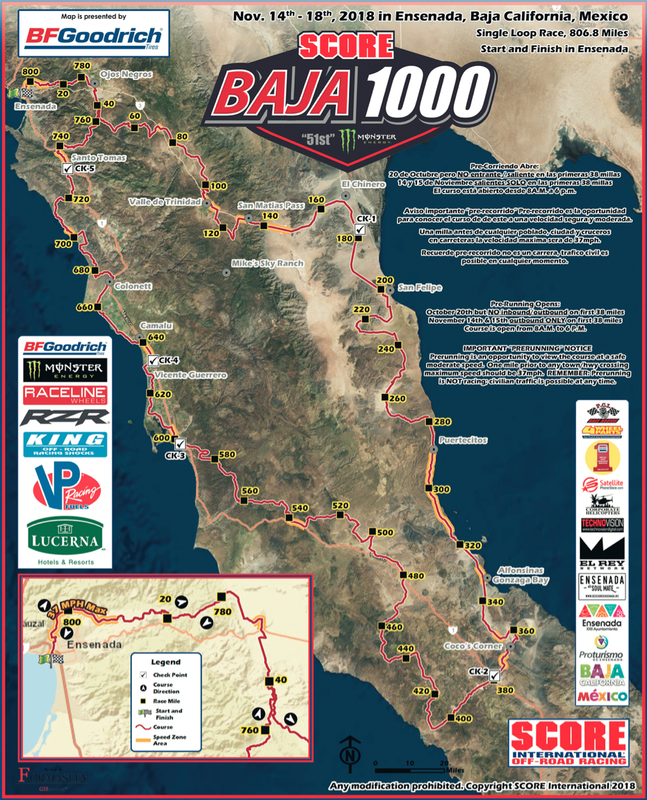 The Baja 1000 is the most legendary and anticipated off-road race ever, with celebrities, professional athletes and general racers competing in the grueling 36-hour race across some of North America’s toughest terrain. The winners will receive a cash purse and the bragging rights to the largest race in North America! 3p will be racing in a 2018 Polaris RZR XP 1000 with a team of 20 members made up of employees and family, including four drivers, four co-drivers plus a large “Chase Team” (support for vehicle fuel, supplies and repairs). EarthWater Limited is a health and wellness company, manufacturing mineral infused high-alkaline beverages and liquid concentrate with the proprietary Hydration Molecular Complex (HMC), using 100% natural, proprietary blends of organic fulvic and humic complexes mined from deep within the earth's surface. Fulvic and humic minerals have rehydrating and detoxifying qualities that can inhibit free radicals and improve absorption of key nutrients. EarthWater. To engage with EarthWater online, you are encouraged to "like," "follow," and "share" the brand's social media pages. EarthWater inquiries can be emailed to info@earthwater.com or visit www.EarthWater.com. DALLAS, TX / ACCESSWIRE / November 8, 2018 / EarthWater www.EarthWater.com a Texas based health and wellness company that makes mineral-infused, high-alkaline beverages designed to provide benefits such as boosting immunity, maintaining nutrient levels in the body’s cells and reducing toxins, is providing complimentary product at the tracks for any member of the United States Military during the balance of the NASCAR Season, through an arrangement with The Garlic Garage https://www.facebook.com/GarlicGarageGang/, a private group that supplies meals for NASCAR teams and additionally, free meals for all military personnel at the tracks. Bruce Zschoche and his wife, Jackie run a catering business, but their clientele aren’t weddings and parties. They are all NASCAR race teams and garage personnel. The Garlic Garage Gang feeds entire teams in both the Monster Energy NASCAR Cup (MENCS) and NASCAR Xfinity Series. The couple have been involved in NASCAR for twelve years, first working with another catering company to get their foot in the NASCAR door. They then did other jobs around the garage — scoring for teams and various other corporate jobs with NASCAR-related sponsors. But four years in, The Garlic Garage Gang became their mainstay. Currently in their eighth year, The Garlic Garage Gang also provides complimentary meals to any member of the U.S. military as a gesture of their gratitude for their service to the country. Jackie Aschoche, Co-Owner of The Garlic Garage stated, “We are thrilled to have EarthWater supply the water for the Military personal we feed at the Nascar races. We have been honored to feed Nascar Troops to the Track, Gold Star Families, Wounded Warriors along with many other military groups and veterans over the past nine years. It is always so humbling to thank the brave men and women for all they have done for our country through a meal. EarthWater Racing recently ran an aggressive race at Texas Motor Speedway in the AAA Texas 500 where Professional Driver David Ragan reached the number 12 position before he was forced to finish in 24th.. EarthWater Drivers previously sponsored by EarthWater http://www.espn.com/racing/drivers all attest to the fact that the products significantly help their hydration and driving while holding onto a 750 HP car traveling in excess of 200 MPH - sometimes for a three-hour period of time. EarthWater Limited is a health and wellness company and manufacturer of mineral infused high-alkaline beverages and liquid concentrate with the proprietary Hydration Molecular Complex (HMC), using 100% natural, proprietary blends of organic fulvic and humic complexes mined from deep within the earth's surface. Fulvic and humic minerals have rehydrating and detoxifying qualities that can inhibit free radicals and improve absorption of key nutrients. EarthWater products are sold through the www.LivePure.com Program and online through the Amazon Exclusives Program. To engage with EarthWater online, you are encouraged to "like," "follow," and "share" the brand's social media pages. EarthWater inquiries can be emailed to info@earthwater.com or visit www.EarthWater.com. 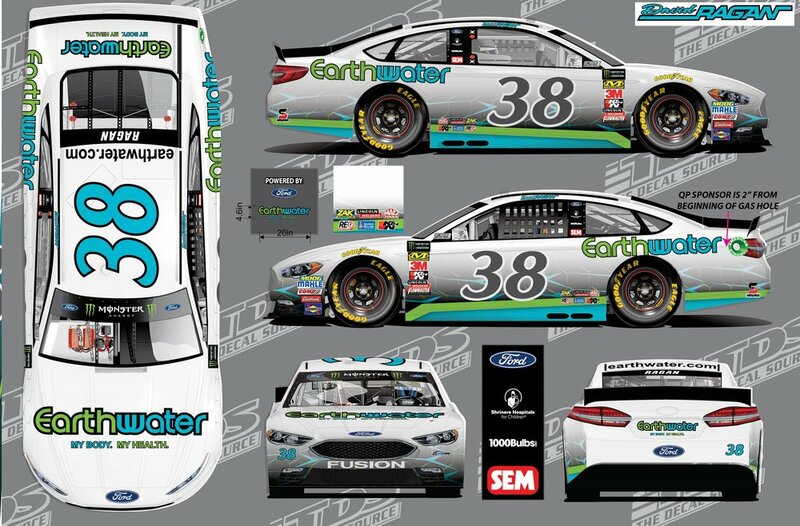 DALLAS, TX / ACCESSWIRE / November 1, 2018 / EarthWater RACING returns to its home track of Texas Motor Speedway partnering with Monster Energy NASCAR Cup Series driver David Ragan for the AAA Texas 500 Sunday November 4th.The Number 38 EarthWater Ford Fusion Car will mark the first partnership between the Texas, EarthWater company and North Carolina, Front Row Motorsports. EarthWater is a health and wellness company that makes mineral-infused, high-alkaline beverages designed to provide benefits such as boosting immunity, maintaining nutrient levels in the body’s cells and reducing toxins. Ragan is a 12-year veteran of the Monster Energy NASCAR Cup Series, with two wins, 15 top-five and 40 top-10 finishes, and two pole positions, including two top-10s and a pole at Texas Motor Speedway. The 2018 season is his fifth with Front Row Motorsports. The Monster Energy NASCAR Cup Series will be at Texas Motor Speedway starting Friday with practice and qualifying, scheduled to air live on the NBC Sports Network at 2 p.m. and 7 p.m. ET, respectively. Saturday’s 12:30 p.m. ET practice will air live on CNBC. Sunday’s 501-mile race on the 1.5-mile oval will air live on the NBC Sports Network, with coverage scheduled to begin at 2:30 p.m. ET. Front Row Motorsports is a winning organization in the Monster Energy NASCAR Cup Series, the premier division of NASCAR competition. The team was founded in 2004 and is owned by Tennessean Bob Jenkins. FRM fields two full-time entries, the No. 34 of Michael McDowell and the No. 38 of David Ragan, from its Statesville, N.C., headquarters just outside of Charlotte. The team's partnership base includes organizations such as Ford Motor Company, Love's Travel Stops, K-LOVE Radio, 1000Bulbs.com and Shriners Hospitals for Children. Visit www.teamfrm.com and follow FRM on Twitter at @Team_FRM and on Facebook at facebook.com/FrontRowMotorsports. PURE: People United Reaching Everyone is a Frisco, TX-based direct marketing, nutritional wellness company celebrating over 10 years in business. The company provides wellness products and a business opportunity in the United States, Japan, Thailand, Taiwan and Korea. Xcelerate 2018 is their 10-year anniversary celebration which starts on Friday, October 19, at 9 a.m. and concludes Saturday, October 20, at 10 p.m. The sold-out event will bring 1400 PURE Independent Business Owners (IBOs) and leaders from around the world to sample new products, place orders, listen to guest speakers and hear success stories. EarthWater will be showcased Friday afternoon as part of the product updates. Founder/CEO CJ Comu will share features of the EarthWater products from stage and samples will be offered throughout the weekend. "This is a historic day for EarthWater and our stakeholders," said CJ Comu. "We are sharing the power of EarthWater Products with the PURE community at Xcelerate. EarthWater is excited about this new relationship with PURE. Our goal is to have people try and share our products." EarthWater Limited is a health and wellness company and manufacturer of mineral-infused high-alkaline beverages and liquid concentrate with the proprietary Hydration Molecular Complex (HMC), using 100% natural, proprietary blends of organic fulvic and humic complexes mined from deep within the earth's surface. Fulvic and humic minerals have rehydrating and detoxifying qualities that can inhibit free radicals and improve absorption of key nutrients. EarthWater products are distributed through PURE and the Amazon Exclusives Program. To engage with EarthWater online, you are encouraged to "like," "follow" and "share" the brand's social media pages. EarthWater inquiries can be emailed to info@earthwater.com or you can learn more at www.EarthWater.com. PURE: People United Reaching Everyone is a leading innovator in health and wellness products. PURE is dedicated to delivering Whole Health with high-quality products for physical health, opportunity for financial health, relationships for personal health, and social impact for philanthropic health. PURE is a global company with offices in the U.S., Taiwan, Thailand and Korea with headquarters in Frisco, Texas. For more information on the products or business opportunity, visit www.livepure.com. DALLAS, TX / ACCESSWIRE / October 8, 2018 / EarthWater Ltd. (www.EarthWater.com), a Texas based health and wellness company manufacturer of high alkaline mineral infused beverages and health supplements, announced their support and involvement with the American Diabetes Association Tour de Cure DFW event on October 20th at the world famous Southfork Ranch in Parker, TX. Register to ride, run or walk with Team EarthWater. Click here to register or make a donation. Our Team EarthWater is supporting the American Diabetes Association because we want to make a difference. We want to lead. We want to inspire. We want to empower. We want a cure! One in eleven Americans have diabetes. We are teaming up now to change the future and make a positive impact in the lives of those who are affected by diabetes. We are committed to participate together and raise money through this inspirational event not just because over 30 million people in the United States have diabetes, but because so many of us personally know some of them and want to do something about it. Click here to support us with a donation! We are determined to reach our team goal, one person at a time. So, let's make a difference together! EarthWater Chairman/CEO CJ Comu., stated, "EarthWater is excited to support the American Diabetes Association 'Tour de Cure' Event in Dallas and help draw awareness to this dreaded disease that affects millions in America and around the world. As part of our mission statement we are delighted to extend our motto of helping to change people's lives. I have also created this public service announcement and encourage other Corporations to join - support and help find/fund a solution to this disease." https://youtu.be/TG1muA2ubaM. EarthWater Limited is a health and wellness company and manufacturer of Mineral Infused High-Alkaline Beverages and liquid concentrate with the proprietary Hydration Molecular Complex (HMC), using 100% natural, proprietary blends of organic Fulvic and Humic complexes mined from deep within the Earth's surface. Fulvic and Humic minerals have rehydrating and detoxifying qualities that can free radicals and improve absorption of key nutrients. EarthWater products are sold through the PURE Network Marketing Program and online in the Amazon Exclusives Program. To engage with EarthWater online, you are encouraged to "like," "follow," and "share" on the brand's social media pages. EarthWater inquiries can be made at: info@earthwater.com To purchase EarthWater products visit www.LivePure.com/TriStar. DALLAS, TX / ACCESSWIRE / October 1, 2018 / EarthWater Ltd. www.EarthWater.com a U.S. based health and wellness company manufacturer of high alkaline mineral infused beverages and health supplements announced today that EarthWater Chairman/CEO CJ Comu will be a Keynote Speaker at the 2018 EBev Conference in Las Vegas, NV on Oct 24-26 http://ebevseries.com. The beverage industry has been in a flurry of high-profile mergers and acquisitions with some recent transactions shocking investors. The global market for sports nutrition accounted for an estimated $28.37 billion in 2016 and is forecast to reach $45.27 billion by 2022, according to Zion Market Research. eBev, the global event series for beverage marketers, is led by Executive Director Seth Hillstrom. As Executive Director of the Beverage Marketing Association, Seth works hand-in-hand with nearly every major brand and agency in the beverage industry. With a goal of furthering the industry through collaboration, efficiency, and the creative use of technology, Seth is oft tasked with identifying and delivering on strategic partnerships that add considerable value for all participants. Working between stakeholders to identify brand-side needs and agency/technology offerings that are well aligned, Seth has helped all sides to come together to produce outstanding results on numerous occasions. Prior to founding Beverage Marketing Association, Seth led a communications team for the City of New York's Department of Finance. He holds a B.S. in Finance from the University of Delaware. The three-day conference will take place October 24-26 in Las Vegas, NV at Caesar's Palace Hotel. 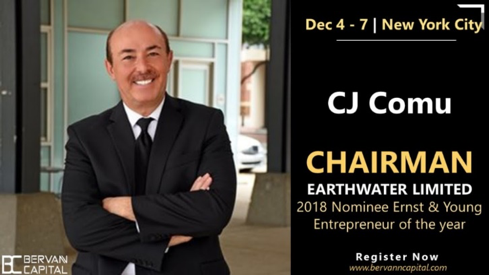 EarthWater CEO/Chairman CJ Comu, stated, "I'm honored to be a part of the fellowship, mind share, experience and network with some of the top leaders in the global beverage industry and lead a session entitled, Life On Line - the great escape from retail." eBev is a conference series dedicated to bringing together the beverage, digital, and technology worlds. As "digital marketing" goes away and "marketing in a digital world" becomes the norm, the way marketers think needs a reinvention. eBev is dedicated to pioneering this mission, and to building a community of beverage marketers that fosters the innovation, disruption, and reorganization that is necessary for this monumental shift. To learn more about eBev please visit http://ebevseries.com. EarthWater Limited is a health and wellness company and manufacturer of Mineral Infused High-Alkaline Beverages and liquid concentrate with the proprietary Hydration Molecular Complex (HMC), using 100% natural, proprietary blends of organic Fulvic and Humic complexes mined from deep within the Earth's surface. Fulvic and Humic minerals have rehydrating and detoxifying qualities that can free radicals and improve absorption of key nutrients. EarthWater products are sold through the EarthWater Affiliate Program and online in the Amazon Exclusives Program. To engage with EarthWater online, you are encouraged to "like," "follow," and "share" on the brand's social media pages. EarthWater inquiries can be made via email to info@earthwater.com. DALLAS, TX / ACCESSWIRE / September 17, 2018 /EarthWater Limited (www.earthwater.com), a UK company, headquartered in Addison, TX, announced the signing of an agreement with Frisco, TX-based PURE: People United Reaching Everyone, a multimillion-dollar nutritional wellness company celebrating over 10 years in business. EarthWater is a health and wellness company and manufacturer of high-alkaline mineral-infused beverages and health supplements, PURE's health and wellness products and business opportunity are offered in the United States, Thailand, Taiwan and Korea. ''PURE celebrates its 10th anniversary this year and we are ecstatic that 2018 is turning into one of our best years in history. We are excited about this partnership with EarthWater. Their products fit perfectly in our hydration and nutrition categories and uphold our mission to deliver products based on the best of science and nature,'' stated PURE CEO, Daren Hogge. EarthWater Limited is a health and wellness company and manufacturer of mineral infused high-alkaline beverages and liquid concentrate with the proprietary Hydration Molecular Complex (HMC), using 100% natural, proprietary blends of organic fulvic and humic complexes mined from deep within the earth's surface. Fulvic and humic minerals have rehydrating and detoxifying qualities that can inhibit free radicals and improve absorption of key nutrients. EarthWater products will now be sold globally through the PURE Network Program and online through the Amazon Exclusives Program. To engage with EarthWater online, you are encouraged to "like," "follow," and "share" the brand's social media pages. EarthWater inquiries may be emailed to info@earthwater.com. DALLAS, TX / ACCESSWIRE / September 11, 2018 /EarthWater Ltd. a U.S. based health and wellness company manufacturer of high alkaline mineral infused beverages and health supplements proudly announced its donation toCommunities Foundation of Texas (CFT) of EarthWater Products to the Men and Women of the United States Armed Forces Overseas as well as those that supported the efforts of the tragic events of September 11th, 2001. On Tuesday, September 11th, Communities Foundation of Texas (CFT) http://cft4b.org/ will host its 17th annual Freedom Day, a community service event honoring the lives lost and those forever changed by the tragic events of September 11, 2001. This year join the massive troop of Member Company volunteers and family members as you serve side-by-side with Dallas-Fort Worth area veterans to highlight the service of female veterans. Last year, over 950+ volunteered with 16 nonprofits across 28 project sites. In recognition of the courage and bravery of the men and women who fight for our freedom, and those first responders who protect us, we dedicate this grand day of service to them by supporting local organizations that provide essential services to veterans and their families and first responders. We will also host a family service day on Saturday, September 15th. Join us for one or both events in honoring our local heroes during one of the largest 911 commemorative community service events in DFW! CFT is incredibly proud of the programs and services that Entrepreneurs for North Texas (EFNT), a program of Communities Foundation of Texas, provided over the last 17 years, which have helped make it easy for companies in our community to do good. Since its inception, EFNT has touched more than 13,000 volunteers from over 100 companies, who have collectively given 45,000 hours of volunteer service valued at more than $1 million. In November 2017, CFT formally launched our expanded suite of services designed specifically to serve the business community and relaunched an expansion of EFNT services as CFT for Business. We will continue to offer annual memberships that give companies year-round access to our Plug ‘n Plays, Freedom Day, leadership trainings, and networking opportunities through our new Corporate Engagement Network. © 2018 EarthWater, LTD | All Rights Reserved.